I recently asked my yoga students on Facebook and in our membership community, what yoga pose do you avoid the most. Crow pose came up a lot. Crow pose is definitely one that I avoid too. Although I would have to say, it if for good reason. The flexion required in the neck so that you can focus to balance pretty much is a migraine trigger for me. I even heard from one of our members that she sprained her ankle trying to do crow pose. I think if the pose is unsafe or injurious, it is a good one to avoid. 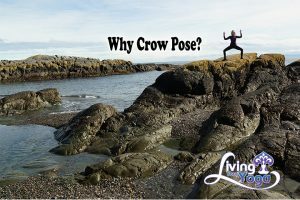 The question I would ask, is why crow pose? At Namaste Yoga, we are all about real yoga for real people, so I would ask, are there better, less injurious and safer ways you could receive those benefits? I would answer that question with a definitely Yes! I can think of one pose that would tone your abdominals, strengthen your arms, back, and wrists and build endurance and focus much more safely than crow. And functionally, surely Goddess Victory Squat is functionally much better for stretching and strengthening your inner thighs and you can even add some balance challenges. And if you still want to try crow pose, here is a class that takes you step by step, with lots of modifications, safely through the posture with lots of propping in our membership community. It is a great companion class to the Namaste Yoga classes on Yoga Postures You Avoid the Most. Today’s question to leave in the comments is: Why do you avoid crow’s pose?